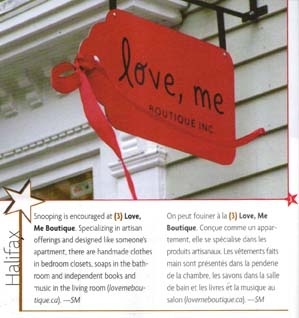 Located in downtown Halifax, the Love, Me Boutique has the lay of home, more specifically an awesome apartment that is close to everything. In fact, this was an apartment until Chara Kingston transformed it into a store featuring handmade designs by independent Canadian artists. The space in a 100-year-old building a block up from Halifax’s official – tourism-sanctioned – shopping drive, Spring Garden Road, boasts a pair of marble-front fireplaces, broad pine floorboards and a wall painted clay red. These elements give off such warmth that the bright spring-like temperature outside seems redundant. And then there’s the merchandise. Nothing you find here is of the mass-produced, souvenir variety. “This is the kind of store I always wanted to shop in, and I always stumbled across when I went to New York or Chicago or to Europe,” says Kingston, a mother of one who is in her early 30s. The owner had a gut feeling that there was plenty of great exciting handmade design being made across Canada and enough of an appetite among shoppers in the city to support her store. Over her first Christmas season in 2007, for example, Kingston rapidly sold out of a bamboo cutting board ($32) from Furni, the Montreal-based design duo of Devin Barrette and Mike Giles. It comes with two stainless steel bowls that sit in a hole cut into the wood. Rubber feet raise the board up from wet countertops and keep it stable. Professional and at-home chefs snapped it up. “I sold six to one customer,” she whispers in disbelief. That board will come in handy for chopping and dicing as you follow a recipe in Zuppa Soupa ($14), a cookbook – yes, of just soups – in honour of local theatre company Zuppa Circus’s 10th anniversary (in 2007). Celebs such as singer-songwriters Jill Barber (curried squash) and Jenn Grant (Indian spiced lentil and tomato) contributed their secret recipes. Interest in the clothes the shop carries goes, naturally, in cycles. After the rush of the first fall season, there’s renewed interest in new fashions with spring coming. And it’s just in time too, as Kingston is introducing new women’s lines from Toronto-based Passenger Pigeon (jackets, skirts and dresses from Heather Schibli and Wendy Traas). She will also carry Naomi Joy Yamamoto’s Flight Path Designs, including belt buckles, jewellery and all manners of bags, from clutches to bigger purses. Kingston spends hours researching on the Internet, reading design blogs and websites such as Design Sponge, and following thread to thread. “Everything is Internet research. You find out about one person and then you find out who they’re friends with,” she says. The inquiries have paid off. She has found unique baby wear, such as onesies printed with wrenches and clothespins on darkly coloured cotton ($23) by Dujoo. Designers, Kingston says, are “talking about a pared-down aesthetic for baby. “A quilt by Fable Industries with blocks of orange and brown and a bird in flight ($190) hangs on an untreated wooden rod near the store’s front window. And Kingston’s own line, Simply-C Designs ($12-$34), features everything from pot holders to velour scarves of saturated reds, deep purple and rich brown poppies and dragonflies in white linen – beautiful wares for a beautiful shop. HALIFAX — Handmade is hot, says Chara Kingston, owner of Love, Me Boutique in Halifax.The Birmingham Street store, which specializes in handmade or small-run Canadian-made clothing and accessories, opened in October.“They’re independent products for independent people,” said Kingston, a California native who studied fine arts at York University in Toronto and worked at the National Gallery in Ottawa before moving to Halifax with her husband in 2000.“I fell in love with Nova Scotia,” she said. Kingston, who said she’s always made things, started a textile design business in Halifax and sold her silkscreen products at the Halifax Farmers’ Market and at Wildflower Clothing before exhibiting at shows like the One of a Kind in Toronto and being picked up by retailers across the country. She said her decision to start her own store was prompted by her enjoyment at bringing artists together — a reflection of her gallery experience — and by the fact that there wasn’t another store in Halifax that carried only handmade Canadian products. “It’s for people who don’t want to buy mass-produced products,” she said, noting that there is a growing trend in North America away from mass production and toward handmade products. Her store is also distinguished by the fact that it is designed to resemble an apartment, so that many of its products, which include Coe & Waito porcelain and Lilikoi ecologically friendly clothing, can be displayed as they would appear in someone’s home. Kingston acknowledged that running her own business has been a challenge, but she said the concept is working. Among those who believed was the Centre for Entrepreneurship, Education and Development in Halifax. CEED, which is funded by the federal and provincial governments, provided Kingston with ACOA financing and with training in marketing and business planning. Sean Cunningham, CEED’s financial program manager, said there is a trend toward destination businesses, and Love, Me Boutique fit that bill by offering unique, all-Canadian objects and clothing. Business considerations aside, Kingston said the most satisfying aspect of running her own boutique, and the one that most appeals to her artistic leanings, is finding products that delight both her and her customers. 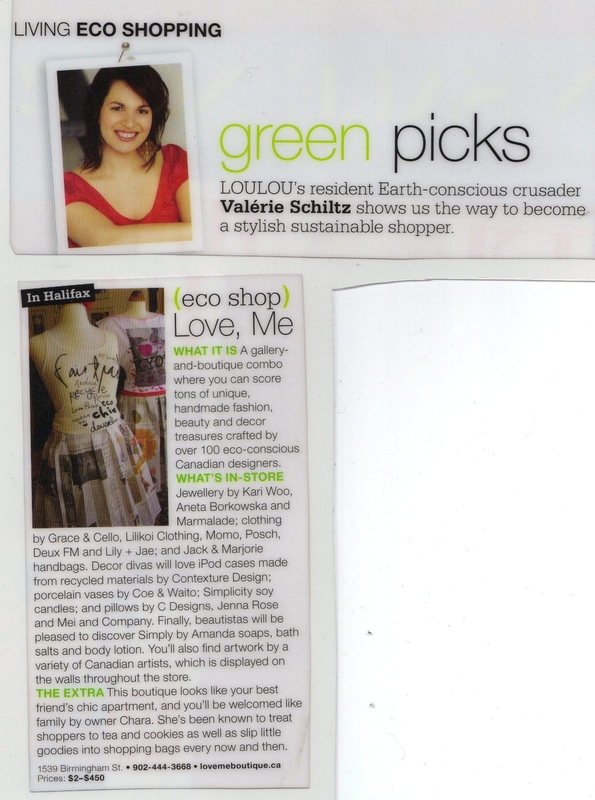 Halifax Magazine’s Holiday Gift Guide (December 2007): Check out love, me boutique product inclusions: the Gatineau Unisex Bag by Jack & Marjorie, Ladies Briefs by The Candi Factory, Sweet Dreams Quotation Pillowcases by Urbanomic, and a felted fish rattle by Aneta Borkowska. Rains drums at the windows as you flip through the closet of skirts and embroidered jackets. Tea is steeping in the kitchen nook, and the living room has comfortable couches and patterned pillows. It feels like you’re wandering around a friend’s cosy loft, but then you catch a glimpse of a price tag – and remember you’re actually in a boutique. “I want this to be a unique shop where you can throw your coat down, try on some clothes, and just have a really good time,” said Chara Kingston, owner of Love, Me Boutique. The Birmingham Street store sells clothes, accessories, and art handmade in Canada. She chose to organize the store to look like an apartment so customers have an easier time picturing the handmade items in their own homes. “They can look in the kitchen area and see how a handmade bowl would actually look in a kitchen, and that it can be used – it doesn’t have to be on your mantel,” Kingston said. The 33-year-old California native moved to Halifax seven years ago, and opened the downtown shop last month. Kingston – who does silk-screening on textiles – wanted to create a place that sold everything handmade, from soap to business suits. “There are places in town that take locally made items, but they still were carrying mass-produced products,” Kingston said. It’s true that some customers will choose items with the lowest price, regardless of the qualify of craftsmanship, but Kingston says things are starting to change. People are recognizing that there are ecological benefits to buying handmade Canadian items. “Artisans are just more aware of what they’re putting in their products. A lot of the artisans use water-based inks when they’re silk-screening, and soy and bamboo cotton for the clothes,” Kingston said. “Because they’re not mass-manufactured, no plant is required, and the local items are just walked into the store. More than 50 Canadian artisans are selling their work in Love, Me Boutique, and Kingston says she’s always willing to add work by up-and-coming artists and designers. “I look at if their item fits with the theme of the store, if it’s good quality, and if I’m already carrying something that’s similar,” Kingston said. Five or 10 year ago, the idea of buying hand-knitted socks or a handmade cotton change purse appealed to those who love yard sales and craft fairs. Today, handmade is hot. She credits the website Etsy.com as a possible source of handmade’s sudden popularity, because it allows crafters to sell their wares with a few simple clicks. “It’s an amazing site, because someone who makes only five things can sell just those five things. They don’t even have to have a similar look – you could have someone selling magnets and jewelry and knitted socks,” Kingston said. One of the boutique’s most unique items is the Love, Me note – a sweet little message tied with ribbon – which is sold for a donation to local artists. Kingston says most people put the notes in their kids’ lunchboxes or tie them onto presents, but some people are using them in very different ways. “I have a client who always comes in and buys them, and when I asked what he was doing with all of them, he said ‘I leave them in the world,'” Kingston said. Love, Me Boutique is located at 1539 Birmingham St. For more information, visit http://www.lovemeboutique.ca. I personally would want to…HaHa). You definitely put a new spin on a subject that’s been discussed for a long time. to your feeds and even I achievement you get right of entry to consistently quickly.